@TogetherWePass Also READ through everything in your prep – you’ll be surprised what you can remember when you’re struggling in an exam! @StuviaSA try fruits and a simple bowl of cereal. Even a healthbar, its enough to keep u going for an exam and its definitely not heavy. @TogetherWePass there is a great amount of study material on youtube, or download subjects as podcasts on iTunes! #studentSA so simple! 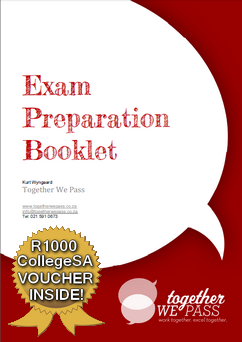 Use adaptive learning test prep – if you are doing #ECS1501 at #UNISA you can ask @togetherwepass about this. Amazing technology! 0 Responses on Exam Revision tips #StudentSA"